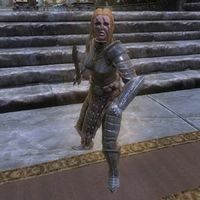 Gormlaith Golden-Hilt was a Nord hero and Tongue in the Merethic Era. She was an accomplished warrior; at least four dragons fell to her blade during the legendary Dragon War. Gormlaith, Felldir the Old, and Hakon One-Eye were the leaders of the rebellion against Alduin, and the first mortals to learn how to wield the Thu'um. Together, they fought against Alduin atop the Throat of the World. Finding that they had no means to achieve a final victory, the companions successfully sent the wyrm forward through time using an Elder Scroll, though Gormlaith was killed before they could banish him. Thousands of years later, the spirits of Gormlaith and her compatriots assisted the Last Dragonborn in the final battle against their nemesis in the realm of Sovngarde. During the TES V: Skyrim quest Alduin's Bane, Gormlaith refers to Hakon as "brother", though it's unknown if this is literal or figurative. This page was last modified on 15 November 2018, at 20:49.